Is it in stock? What domestic shipping method is used? When will I have it? Can I track my domestic package enroute? I'm outside the USA / Canada. How can I order your products? Will it work on my voltage? How do I pay for my purchase with a credit card? What is a phono preamp, and why would I need one? Why not just buy a turntable with a built-in preamp, and maybe USB too? Isn't this simpler? Who makes the preamps that Phonopreamps.com sells? Which phono preamp is best for me? How can I purchase a replacement AC adaptor? Why is there no power switch on most phono preamps? And why are there no AC cords on the ones Phonopreamps.com sells? What do I do with the ground wire on my turntable? 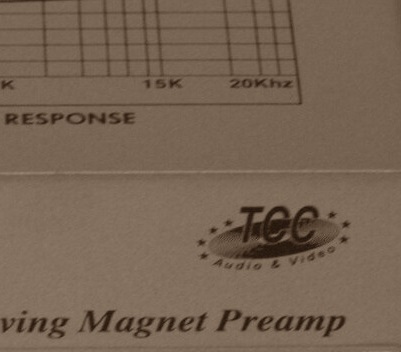 What's the difference between moving magnet, moving coil and ceramic cartridges? How do I play or record from 78rpm records? I'm getting distorted or overloaded sound. WHY???? Why do my store-bought CDs sound different (or louder, or better) than my records? How do I copy records onto CD-Rs? How do I use the NAB hub adaptors you sell on my reel-to-reel? Having trouble connecting to Paypal or one of the other payment servers? Silver Finish Advisory; We've recently received several buyer reports that the silver model images on this website do not match the actual color of products they have received. We've looked thru our inventory and must agree; the majority of our current silver finish stock has a definite gold or sepia cast (see at right). Buyers should take this into account when choosing to order silver versions of our products. I'm outside the USA. How can I order your products? Will it work on my voltage? We ship worldwide, and our payment processors support most countries and currencies. Fax or mail orders are accepted ONLY from the USA and Canada. USPS First Class shipping is used for all non-US destinations. This is are not normally a trackable method, although this varies from country to country. The customs tag number we provide via email allows acceptance confirmation (time and place of mailing via the USPS website), and delivery confirmation may also be also provided if this number begins with LZ. We reserve the right to drop-ship some larger items directly from TCC in Taiwan using EMS. We do this infrequently and very selectively, mostly to Far East destinations; but also to countries where delivery is problematic and EMS tracking can provide protection against pilfering or loss. IMPORTANT; Orders shipped outside the USA may require the payment of VAT, import duties and any other taxes the destination country sees fit to charge the buyer upon delivery; these are the buyer's responsibility and are NOT included in what we charge for the product or shipping. Some postal systems charge the recipient a brokerage fee as well. Some countries may use third parties other than the domestic postal system to deliver international parcels, and these entities may add a delivery fee to customs costs; Chronopost in France is apparently an example of this. Small items such as cartridges, styli and hubs may fall below the minimum amount eligible for tariffs. Because of NAFTA, most items shipped to Canada and Mexico are exempt from customs duty; however we CANNOT gaurantee this and you should inquire with your tax folks before purchasing if you are concerned about import costs. All preamps we sell except for the TC-780i and TC-450 (for which AC adaptors are optional) include power supplies. Plug styles and voltages we stock are shown below; we use the guide available here to determine voltage and plug sent. You may need to obtain a plug adaptor to match your local mains plug style. This applies in particular to RSA buyers who will receive the EU plug style "C" shown below, as will all TC-400G/L buyers requiring a 220/240VAC adaptor. How do I pay for my purchase with a credit card? Is it safe? This website collects NO information from or about visitors. In the event that you make a purchase thru Paypal or Authorize.net by using one of the payment buttons provided, we will not use your email address, shipping address or any other info they provide to us to send you advertising, nor will we share this info with anyone for any purpose other than the fulfillment of your order or the resolution of order-related issues. Click on the logos below to view the privacy statements of our payment processors. Our preamps and switchers are simple and straightforward to use, and everything needed to connect and utilize them can be found on the back of the box or on our website's product detail page for the item purchased. The only caveat we would offer is to NEVER connect any of our preamps to a phono input on your stereo (or mic input on your computer); always use a line level input such as CD or AUX. This is clearly stated in the box instructions and on our detail pages; nonetheless (based on emails we receive), using PHONO or MIC is the most common cause of user hookup issues. Instructions for using our NAB hub adaptors are on our Hubs FAQ Page. 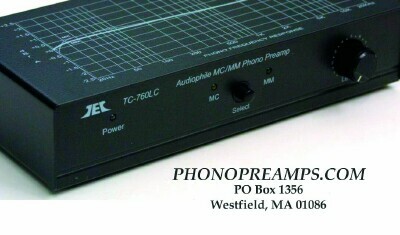 What does a phono preamp do, and why would I need one? The output from a magnetic cartridge installed in a good quality turntable is MUCH lower than that provided by line level sources like CD or tape, and requires an additional stage of amplification. The recording process used to create records also adds equalization which must be removed during playback to restore proper tonal balance. Most older receivers and amps included an additional gain and RIAA re-equalizer stage, allowing direct connection of a turntable. Whether your equipment has this is easy to determine; look for PHONO on your source selector switch, and jacks labeled PHONO on the rear. Newer stereo equipment made after 1990 often has NO phono input; this is true of most mini-systems and home theatre units, as well as many stereo receivers and amps. Manufacturers seeking to lower production costs began leaving out the phono input because records and turntables are supposedly obsolete in today's world dominated by CDs and DVDs. In order to connect a turntable to these stereos, you need to first pass the signal thru an external RIAA phono preamp to bump the level and fix the equalization. 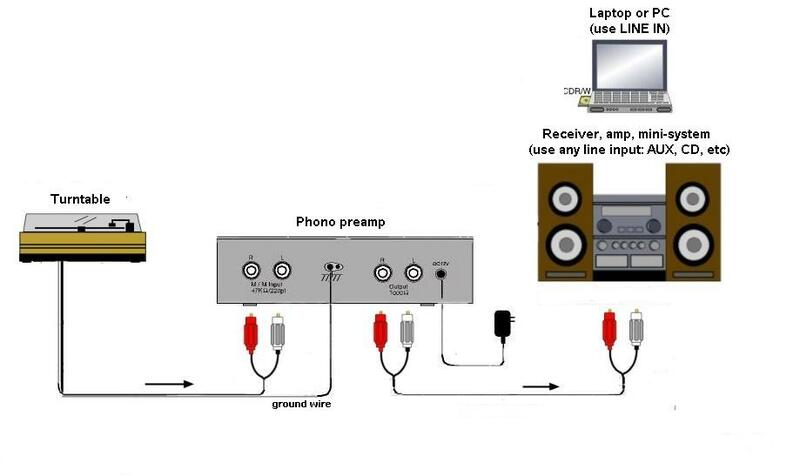 This also applies if you're connecting a turntable to a computer sound card's line input so you can make CD-Rs from LPs; again, a phono preamp is needed to first add gain and tonal correction. We include the needed plug adaptor for computer use. All of our preamps connect to line inputs only; AUX, CD, MD, DAT, TAPE IN, TAPE MON all will work fine. A/V line inputs also can be used (simply ignore the video jack); these include TV, VCR, DVD, LINE etc. Click on the diagram below to view a larger version. NEVER use an RIAA phono preamp with other sources like iPods, MP3 players etc; doing this guarantees overloading and massive distortion. Only turntables require the 40dB gain and re-equalization a phono preamp provides. Our TC-780LC and TC-780i line preamp models are designed specifically for use with portable audio devices, TV audio and other line level sources which may need boosting to better match the inputs on your stereo or mobile audio system. Yes, it is. Perhaps you recall the ancronym KISS... "keep it simple, stupid!" Good advice perhaps for planning a military campaign, but a terrible idea when looking for the best sound or digital copies from your records. Combo products generally give you the bare minimum of everything they include. We've yet to see a built-in preamp which has specs to equal our least expensive model, the TC-400G/L. Sharing a single power supply between the electrically noisy turntable motor and the very sensitive preamp stage is a truly dumb idea. The preamped tables we've looked at (most are made in the same factory) provide little or no shielding for the preamp section, feature horrendous plastic tonearms with pin type pivots like the ones found on kiddie record players, and have plastic platters. Audio enthusiasts made fun of turntables like this back in the 70s when they first appeared in department store compacts and mini-systems; now they're being shamelessly sold as component stereo equipment and labelled with big brand names. And then there are those USB turntables... the ones they sell on the TV shopping channels and at the mall. Take all the bad stuff we had to say above about tables with built-in preamps (all MM cartridge USB turntables have one), and add vinegar. Sure, the USB convertor in the table connects directly to your computer, bypassing your sound card and line input. This is simpler, and simple is good, right? Actually, not so much. Bypassing your sound card means bypassing its ADC (analog/digital convertor) and replacing it with the one in the table. Trouble is, the ADC in your sound card or laptop is almost certainly better. Many if not most good sound cards today can handle 32-bit word lengths, but most USB turntables are limited to 16. The record level controls in Windows and Audacity (our favorite FREE audio ripping program) are guaranteed to work with your sound card and its line input; they do NOT work with many USB turntables. This can leave you with MP3 files and CD-Rs that are either too loud, or too soft when compared with store-bought CDs and other music sources. Lastly, at least a few USB "turntables" (this includes the ones trying to look like old-time record players) have CERAMIC cartridges; they not only produce inferior sound and digital files, they can trash the record in the process! Why are there no AC cords on the ones Phonopreamps.com sells? A) Separating the power supply physically from the preamp circuitry reduces circuit and AC noise, and improves S/N ratio. B) The power supply can be replaced in the event of lightning or surge damage without having to replace or repair the preamp. Moving magnet (MM) cartridges are the common variety found in component stereo turntables as well as older name-brand compact stereos and rack systems. They feature high output impedance (typically 47k ohms) and a removeable, replaceable stylus (what many people refer to as a needle); MMs are the type all of our phono preamp models work with. Moving coil (MC) cartridges are a rarified breed mostly popular with audiophiles. MCs rarely have replaceable styli, and can cost more than than many of us spend for our entire stereo systems. If you have a moving coil cartridge, chances are you know it; you do not acquire one of these accidentally or by purchasing a second-hand turntable at the flea market. MCs are low impedance devices (anywhere from 10 to 1000 ohms); a step-up transformer or "pre-preamp" must be inserted between the cartridge and an existing MM phono preamp. We do NOT sell such add-ons; instead our product line includes two switch-selectable MM or MC preamps (our TC-760 and TC-760LC models) which connect to a line input, just as our MM-only models do. Buying one of these two models covers all possibilities if you are unsure whether your cartridge is MM or MC, and also allows you to switch types down the road should you choose. A) Locate a ceramic cartridge record changer that has 78 on the speed selector (generally the cartridge will have a flip-over needle, with LP on one side and 78 on the other); hook it to a line or aux level input on your stereo or sound card (no preamp required), and have at it... fidelity isn't an issue here, but remember most 78s have no lead-in groove, so you'll have to cue up the record by hand; and keep a quarter handy, you'll probably need it to weigh the arm enough so it won't skip. Expect the results to resemble what you hear listening to music thru a telephone. 1) The turntable already has a built-in preamp. All tables which provide a USB output and many others have this; usually the built-in preamp can be bypassed or turned off with a switch (look on the rear panel, or under the platter mat). Putting two preamps in series results in overloading or distortion. If you do not have the user's manual and are unsure whether your table has a built-in preamp, we can determine this if provided with the make and model. 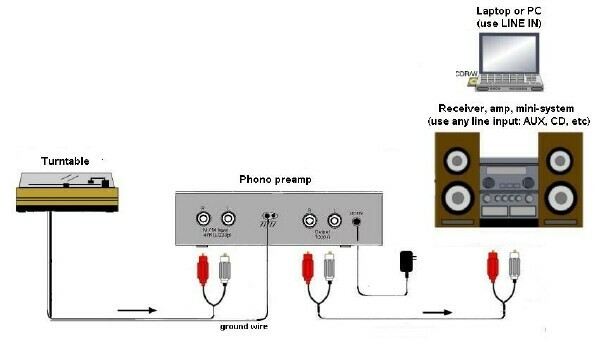 2) Our preamp's output is connected to a phono (or mic) input instead of a proper line level input (CD, AUX etc) as instructed in the box rear panel instruction. Just as in (1), putting two preamps in series results in overloading or distortion. Many computer sound cards use the same jack for both mic and line level inputs, providing a software switch (often labeled attenuator or 20dB cut) in the audio management window. Most Apple laptops (and some desktops) have NO analog line input suitable for connecting a preamp thru. We recommend connecting thru a USB audio device such as our TC-ADUSB when this is the case. 3) The turntable being used has a ceramic cartridge, not the magnetic cartridge phono preamps are intended for use with. Such a cartridge produces 100 times the proper output level, overloading the preamp. If you do not know what kind of cartridge you have, we can determine this if provided with the table's make and model. 4) Input signal WAY too high; never connect an RIAA phono preamp to line level sources like iPods, MP3 players etc. Doing this guarantees overloading and massive distortion. 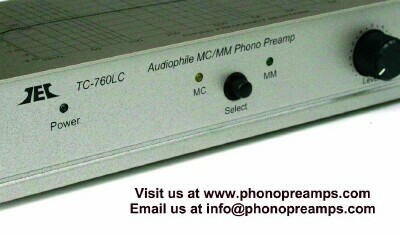 Only turntables require the 40dB gain and re-equalization a phono preamp provides. 5) "Mechanical" issues; possibilities include a dirty, worn or clogged stylus, tracking setting error (usually set too low), acoustic feedback (caused by the speakers too close to or facing the speakers) and rumble (turntable mechanical noise being picked up by the stylus; usually due to a locked suspension, missing rubber feet, a hardened idler tire or a bad motor). 6) Settings on the receiver or home theater receiver are at fault. The next section covers this subject in greater detail, but it all boils down to this; "the first and foremost fix for poor phono sound quality when using a home theater receiver or system is TURN OFF THE DSP / SURROUND FEATURES." Read on to see why. Why do my store-bought CDs sound different (or louder, or better) than my records (or the digital copies I make from them)? Why are the vocals missing? Answering this requires a basic explanation of some differences between digital music storage (including CDs, DVD audio, MDs, and MP3 files) and analog sources like LPs and cassette tape. That shiny new Dolby Digital receiver you may have recently purchased can also be partly to blame... The first and foremost fix for poor phono sound quality when using a home theater receiver or system is TURN OFF THE DSP / SURROUND FEATURES. Why is this? FIRST; stereo separation is the difference in content between the left and right channels that helps your mind recreate a full spacial sense of the original music stage (violins at the left, horns in the middle, piano on the right etc. ), even though it comes from only two speakers. Phono records have a limited ability to provide discrete left and right images, so left channel content appears (at a greatly reduced level) in the right channel, and vice versa. In a proper mix, most of the musical content is shared by both channels and appears in the "middle". Separation is measured in dB; stereo LPs can provide 20-30dB depending on the music and the cartridge in use. Digital recordings have no such limitation; each recorded channel is discrete and can theorically remain so until mixed by your ear during listening. In practice, doing this sounds very artificial and unmusical, so CDs and other music is usually mastered such that separation levels are limited and not that much wider than those found on LPs (although the temptation to "tweak" separation and imaging when remastering music originally released on LPs produced some truly awful early CDs during the 80s). TV audio is entirely another matter; MUCH higher separation levels are often used to provide a massive spacial sense, and additional rear audio images allow you to sit right in the middle of a scene. A center front speaker provides the middle "fill", so the left and right front speaker signals contain much less shared material. The DSP circuitry and various separation schemes (Dolby, DTS) used to create these additional images and audio channels rely on imbedded digital cues contained in the original audio content of DVDs and TV broadcasts. Analog phono audio contains no such cues, and the phasing manipulation and other software tricks used by most home theater receiver DSP processors to create hall and other spacial affects from digital stereo audio sources like CDs fail miserably when playing records. One of the most common complaints resulting from this is that the vocals are missing or much softer than the rest of the music. The first and foremost fix for poor phono sound quality thru home theater receivers is TURN OFF THE DSP / SURROUND FEATURES. Setting the receiver to plain-jane two channel stereo cures most complaints that phono sounds thin or weak when compared to CDs (or the way you remember records sounding on your old stereo). Once you've done this and rediscovered what your records should sound like, you can then experiment with other settings to find usable ones. Some home theater receivers have "three channel" stereo; this puts your center speaker back to work and usually works pretty well with analog audio. We've seen some inexpensive "home theater in a box" systems which are so TV-focused that the DSP features simply cannot be turned off; do not purchase one of these if listening to music is important to you. SECOND; dynamic range is the difference in recorded level between the softest portion (<) of the music and the loudest (>), usually measured in dB. For digital sources, we'll portray this range visually as <------------->. For LPs and other analog storage methods, this range is considerably less; <-------->. You'll hear this difference as less punch and nuance, even though the average volume may be the same. Back when all audio storage was analog (e.g. records and tape), DBX and others made dynamic range enhancer devices that "stretched" the music during playback to widen the dynamic range. These gadgets had their limitations and could create hiss level "pumping" and other artifacts which were quite audible with headphones. With digital audio, only the live music being recorded, the bit rate chosen, and the human ear's ability limits usable dynamic range. If you dub without modification a record to a digital storage method like CD-R or MP3, the dynamic range of the original vinyl is all you'll get on the copy. Backround surface hiss, pops and clicks will all be faithfully reproduced as well. More sophisticated audio dubbing software often includes the means to increase the copy's dynamic range and reduce or remove unwanted noises if you so choose, but take notice that other unwanted affects may appear in their place. Similar sophisticated digital techniques are used today when remastering older music originally studio-recorded on analog tape so as to widen dynamic range and minimize other limitations or flaws. CDs manufactured from these remasterings can sound very different from the original releases of the same music on LPs; whether they sound better is up to the listener to determine. Part of the reason playing records (as opposed to dubbing them to CD or MP3) has made a comeback relates to those differences; a significant number of listeners prefer the original unaltered "analog sound" (warts and all) obtained only by listening to the record itself. We do not require an RMA, but we do ask that you notify us before returning any item. Please include copies of the invoice and any relevant email correspondence. DHL, FedEx and UPS will not deliver packages addressed to a PO box. Most of the products we sell carry a one year defective exchange or repair warranty from us. Exceptions are the TC-400G/L, TC-450, TC-750 and TC-750LC models which carry a limited lifetime defective exchange or repair warranty to the original purchaser. Here's what LIMITED means; A) disassembly or modification of the product voids the warranty B) the warranty does not cover physical damage or other abuse (such as damage caused by connection to an AC adaptor other than the one we supply) C) the stated warranty applies to the principal product itself (preamp. selector etc), not to included accessories. AC adaptors and other accessories are warranteed against failure or defects for sixty days. Many if not most adaptor failures result from power surge or lightning exposure; they are designed to serve as fuses, thus preventing damage to the products they power. AC adaptor replacements can be ordered using the links on our home page. Again, our product warranty covers defects in manufacture and product failure; it does not cover physical breakage or other abuse (stylus and cartridge buyers take note; we hand inspect every item before shipment). Many apparent product defects or failures are often actually hookup or inappropriate usage issues which can be resolved simply by emailing us via the button at the bottom of this page. When doing so, please provide as much info as possible about what you purchased from us, the audio equipment our product is being used with and the nature of any issue needing resolution. Products being returned for refund or exchange require our prior approval within thirty days of purchase. Such items must be in as-new condition and include all supplied accessories as well as the original manufacturer's gift box packaging. Returns which upon receipt do not meet these conditions may be accessed a 20% restock (or refused and returned to the buyer). Refunds are credited against the original payment method, and are limited to the purchase price of the item; shipping is not included. Items with free shipping are assessed a fee of $2 if returned undeliverable or for refund.